Superman has recognized at last the greatest threat to humanity, and he is out to rid the world of nuclear weapons. But Lex Luthor, now a nuclear arms entrepreneur, creates Nuclear Man - a solar-powered Kryptonia Android and genetic clone whose powers equal (and potentially surpass) those of Superman - to rid the world of the Man of Steel. Christopher Reeve once again dons the Superman costume, this time for director Sidney J. Furie, receiving wonderful support from regulars Margot Kidder, Gene Hackman, and Jackie Cooper in addition to newcomers Mariel Hemingway and Jon Cryer. As I prepared to write this review of 1987’s Superman IV: The Quest For Peace, I tried to think of other films that were the fourth in a running collection. Frankly, this wasn’t easy, as very few series make it to a fourth offering. There are a reasonable number of trilogies, but not a lot that reach tetralogy status. Actually, the number of fourth - or even fifth or sixth - films has increased in recent years due to direct-to-video programs. These have extended the lives of many series, not that many people seem to care, or even know about them. For example, how many are aware they can watch House IV or Air Bud IV? If we narrow the field to movies that played theatrically, the prospects decrease. One common factor occurs, however: very few of the fourth entries receive a lot of praise. Probably the best-regarded fourth is 1965’s Thunderball, a film some feel is the best of the bunch. While I don’t much care for it, 1986’s Star Trek IV: The Voyage Home is also one of that series’ most popular releases. Some folks really enjoy 1988’s A Nightmare On Elm Street 4: The Dream Master as well. Otherwise, the pickings tend to be slim, at in the court of public opinion. Despite its enormous financial success, 1999’s The Phantom Menace remains the least-liked of the four Star Wars movies to date. Rocky IV also did well at the box office, but time has not been kind to it, and many fourth entries did poorly financially and critically. 1987’s Jaws: The Revenge tanked, and Alien Resurrection and Batman and Robin - both from 1997 - failed to regain their prior audiences. The curse of the fourth film also affected Superman IV. After the silly comedy of 1983’s Superman III, fans thought the series couldn’t get any lower, but this inane and moronic affair proved them wrong. This was too bad, as SIV actually had some elements that might have allowed it to be a decent film. 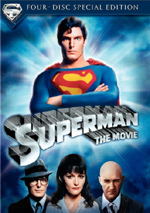 In this sequel, three main plot lines occur, each of which affects Superman/Clark Kent (Christopher Reeve) in a different way. Of global significance, Supes decides to ignore the non-interference directive sent to him by his Kryptonian relatives/mentors. They told him not to direct alter the course of human events. Hmm… isn’t that what he does every time he rescues someone? Apparently Supes interpreted this to preclude more history-changing events, such as, say, ridding the Earth of all nuclear weapons. He receives a letter from obnoxious urchin Jeremy (Damien McLawhorn) that requests he do exactly that. After a struggle with his conscience, Superman decides that he is enough of an Earth resident and not just a visitor from the stars, so he concludes he must take this pro-social action. At the same time, Superman’s old arch-nemesis Lex Luthor (Gene Hackman) escapes from jail with the aid of his moronic Valley Boy nephew Lenny (Jon Cryer). Since Supes has rid the planet of nuclear weapons, Luthor decides to kill two birds with one stone. He becomes involved with the illicit trade of such bombs partially to rake in the dough, but he does it mainly to enact the downfall of his foe. Luthor steals a lock of Superman’s hair located in a museum exhibit, attaches it to a nuclear device, and ensures that Supes will toss it into the sun, the location he uses to destroy the bombs. From there, science does the rest. The nuclear energy combined with that of the sun takes Superman’s DNA and creates a new ultra-powerful dude: the creatively named Nuclear Man (Mark Pillow). He’s as strong as Supes, and apparently his razor-sharp nails can poison our hero as well. NM’s one Achilles heel? Without sunlight, he collapses into a heap. While Superman rids the world of nuclear weapons and Luthor plots his enemy’s downfall, another matter concerns alter ego Clark Kent. A Rupert Murdoch style media mogul named David Warfield (Sam Wanamaker) buys the Daily Planet and instantly turns it into a muckraking tabloid. He installs his daughter Lacy (Mariel Hemingway) as the head and instructs her to keep an eye on the bottom line. Instead, she espies Kent and immediately tries to woo him. This leads to some alleged comic hijinks, especially when Lacy and Lois Lane (Margot Kidder) double date with Supes and Clark. From what I understand, Reeve didn’t want to do another Superman flick after the debacle of the third edition, but the film’s producers lured him back with the promise to use his creative input. As such, Reeve got a story credit for SIV; apparently he pushed the nuclear disarmament aspects of the tale. While his heart was in the right place, these parts of the film were appalling in their corniness. As a whole, the movie often felt like one of those TV shows touted as “a very special episode of…”; the scene in which Supes lectures the United Nations came across as downright embarrassing. I also felt bad for Hackman. He acquitted himself well in 1978’s Superman and 1981’s Superman II. Along with Marlon Brando, he actually made it acceptable for “serious” actors to play comic book roles. However, Hackman’s turn in SIV had “paycheck” written all over it. He mailed in his work as he seemed to try as hard as possible not to actively embarrass himself. Unfortunately for Hackman, he was saddled with Cryer. Lenny was clearly envisioned as a replacement for Otis (Ned Beatty), Luthor’s sidekick from the first two films. I don’t know why Beatty didn’t reappear here, and I can’t say if the producers attempted to hire him and he declined or if they always intended to omit Otis from the story. In any case, Lenny showed virtually no characteristics that differentiated him from Otis. In fact, composer Alexander Courage - best known as the writer of the theme from Star Trek - simply appropriated Otis’s music from the first film and used it for Lenny. Cryer was an actively grating presence during SIV; he added nothing to the flick and strongly detracted from any positives it may have offered. Granted, I’m not sure what those positives might have been. Actually, Nuclear Man could have become a good villain, and it should have been fun to see Luthor again, especially after the tepid baddies of SIII. I can’t fault the good intentions of Reeve’s anti-nuclear message, and the new ownership of the Daily Planet should have provided some sparks in that milieu. That’s a lot of “should haves” and “could haves”, all of which add up to diddley in the final product. Unfortunately, SIV was an absurdly amateurish production, and the story was told in an incoherent, disjointed manner that rendered any possible positives moot. Quite a lot of footage was shot for SIV but not used past test screenings. I have no idea if this extra material would have formed a more cohesive product, but it couldn’t have hurt. Even for a fantasy film, SIV seemed absurdly illogical. I usually turn off the part of my brain that questions those aspects of these kinds of films, for I think many of them just have to be accepted. For example, when my then-girlfriend and I saw Shrek, she complained due to a scene in which a character removed an arrow from his body but no blood appeared. I pointed out to her the fact that she happily accepted the concept of a talking donkey but strangely had trouble with this other bit of artistic license. Unfortunately, SIV was filled with “talking donkey” elements that made it even harder to stomach. For example, in one scene Nuclear Man takes Lacy into space with him. It was bad enough to see hair and capes waving in the air-free environment, but the simple fact that she couldn’t survive in such a place made the scene excessively absurd. I won’t gripe about movies that show explosions in space, for I understand that they provide a necessary dramatic impact. SIV, however, simply crossed the line of reasonable liberties and became stupid. To add insult to injury, SIV featured easily the worst effects of the series. You need to see the flying scenes to believe them. Sure, those elements of the first film don’t seem as convincing now as they did in 1978, but they still seem reasonably positive. The shots from SIV wouldn’t have looked good in any era. The characters appeared as though they’d been cut from other frames and simply plopped onto backgrounds, and I’ve never seen such heavy bluescreen artifacts; a very obvious blue halo surrounded the actors at all times. Shouldn’t the effects have improved as the series progressed? 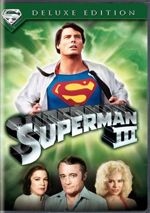 Unfortunately, nothing about Superman IV seemed superior to any of the prior entries. 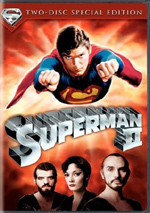 For those who thought Superman III was as bad as it could get, think again. SIV suffered from an incoherent narrative, flat acting, ridiculous logic flaws and some of the worst special effects ever captured on film. I hate to report that the Christopher Reeve era of the Superman franchise went out on such a poor note, but Superman IV was the dregs. 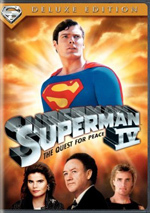 Superman IV: The Quest For Peace appears in an aspect ratio of approximately 2.35:1 on this single-sided, single-layered DVD; the image has been enhanced for 16X9 televisions. Although it showed a few concerns, I thought the movie presented a generally satisfying picture. Actually, it didn’t start out terribly well, but SIV improved considerably as it progressed. During early scenes, sharpness was a moderate concern. Some shots looked a bit soft at times, but these problems became a non-issue fairly quickly. As a whole, the movie offered a fairly crisp and detailed image once we got past those initial concerns. Moiré effects and jagged edges presented no problems, and print flaws were surprisingly minor. Light grain appeared at times throughout the film, and a few specks also cropped up on occasion, but most of the movie seemed to be clean and fresh. Colors looked reasonably rich and vivid. At times they came across as a little drab and flat, but during the majority of the flick, I thought they appeared fairly bright and vibrant. Black levels were acceptably deep and dense, and shadow detail seemed to be appropriately heavy but not excessively opaque. In the end, Superman IV offered a nicely clear and attractive image. As was true of the picture, the Dolby Surround 2.0 soundtrack of Superman IV provided an erratic affair, but it improved as it progressed. The soundfield offered a moderately engaging experience. The forward channels demonstrated reasonably good spread, and audio blended together fairly well. I heard some good examples of panning between speakers, and the overall impression was that the front spectrum seemed to be relatively engaging and active. Surround usage largely restricted itself to general reinforcement of the front channels, but a few more active instances occurred. For example, the shots in the Fortress of Solitude offered nice ambience, and the action sequences became moderately lively. Audio quality showed some bland tendencies, but it seemed to be decent as a whole. Dialogue was reasonably warm and natural, and I detected no problems related to edginess or intelligibility. Effects varied from flat to fluffy. For the most part, those elements lacked much depth, but on a few occasions, they came to life nicely. For example, the nuclear missile scenes provided solid and rich bass response. Music also appeared to be somewhat restricted for the most part. The score showed decent highs, but the low-end lacked for the most part. Bass response wasn’t poor, but I thought it sounded moderately drab. A little hiss appeared in the background at times. Ultimately, despite some concerns, the audio for Superman IV worked acceptably well for an aging film. How did the picture and audio of this 2006 Special Edition compare to the original DVD from 2001? Both seemed very similar to me. I can’t say for sure that the two DVDs used the same transfers, but I didn’t see any noticeable improvements for the 2006 image. Whereas the old DVD included no real extras, this Special Edition throws in a few components. We open with an audio commentary from co-screenwriter Mark Rosenthal. He provides a running, screen-specific discussion. The track looks at the story and its development, deleted sequences, budgetary issues and the many problems that affected the production, cast and characters, sets, locations and effects, and a mix of other production concerns. Most commentaries offer an annoyingly rosy view of events. That certainly isn’t the case for Rosenthal’s chat. He gives us a uniformly dark view of the production as he details the issues that ensured SIV would be a mess. However, lots of complaining doesn’t ensure a fine commentary. Indeed, at times Rosenthal’s grousing becomes a little too much to take, as he’s so relentlessly negative about the production. Perhaps a movie as crummy as SIV deserves that, but I still think the negativity grows somewhat tiresome. In addition, Rosenthal goes silent quite a lot, and those gaps make the track move more slowly. Don’t get me wrong: there’s more than enough interesting material here to make the commentary worthwhile. I just wish it offered a more dynamic and less crabby look at the flick. In addition to the film’s trailer, we find 15 Deleted Scenes. These fill a total of 30 minutes, 56 seconds. We see “Clark’s Morning” (1:25), “Jeremy’s Letter” (0:33), “Superman’s Visit” (1:09), “Nuclear Man’s Prototype” (5:27), “Metropolis After Hours” (2:31) “Lex Ponders” (1:33), “Flying Sequence (Extended Scene” (2:35), “Battle in Smallville” (2:49), “Battle in the USSR” (1:12), “Nuclear Arms Race” (2:08), “Superman’s Sickness” (0:59), “Red Alert” (5:24), “By My Side” (0:20), “Clark and Lacy Say Goodbye” (0:58) and “No Borders” (1:49). Since apparently 45 minutes of footage was sliced from the original director’s cut, I guess we don’t get all of the footage here. Nonetheless, we find most of it, and it’s interesting to see. That doesn’t mean these clips are actually good, of course. Indeed, most are just as terrible as the footage in the final cut. Among the more intriguing elements, we see Luthor’s first attempt at Nuclear Man, a strong but moronic dude the flick plays completely for laughs. Luthor gets a lot more screen time in these shots; he’s not nearly as much of an afterthought. Most of the other scenes tend to expand upon existing sequences and simply flesh them out a little better. At least we get some resolution to the opening notice that the Kent farm is for sale, but the “No Borders” ending with Supes and Jeremy in space is completely idiotic. They make the story moderately more intelligible, but I expect that the movie would remain pretty terrible even if they’d been retained. It’s nice to see these scenes as a curiosity, but they can’t redeem this atrocious film. Superman IV is an unmitigated dud that does nothing other than taint an already sullied franchise. It manages to make Superman III look good by comparison, but that’s its only substantial achievement. The DVD presents pretty good picture and sound along with a couple of useful supplements. Obviously I can’t actually recommend such a terrible movie to anyone other than Superman completists. If you already own the original DVD, you’d only want to “upgrade” to this one to get the extras. I think picture and audio remain the same, but this edition adds some interesting components.